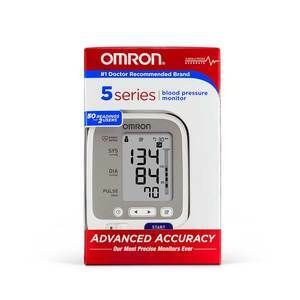 The 5 Series home blood pressure monitor with Omron's Advanced Accuracy helps ensure consistent, precise readings. This model is quick and easy and has a few more features than the 3 Series Upper Arm, like dual settings for two users, memory storage space for up to 100 readings and a wide range d-ring cuff that fits medium and large sized arms. This item is FSA (Flexible Spending Account) eligible. See quick start guide and instruction manual for directions.